This event was a one-off experimental competition using a different scoring system. Similar events had been run before, such as the Cahors Open Free Trial, but never before in the UK as far as we know. It's a competition format which awards points for making gates (so the winner ends up with the most points), rather than having penalty points for dabs. 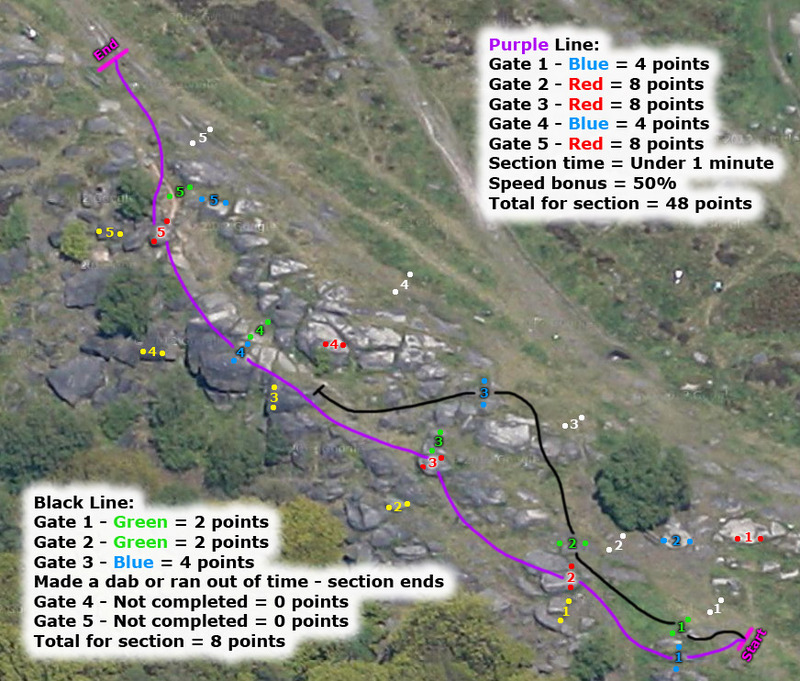 - We used the traditional categories, white through to yellow, but with this system you could ride any colour gates. There were 5 numbered gates of each colour per section, and the rider attempted up to a maximum of 5 gates, in numerical order. You picked any colour gates you wished as long as they are done in the correct order. So, for example, the rider could have chosen Blue for the first 3 gates, then do a Green, and finish with a Red. 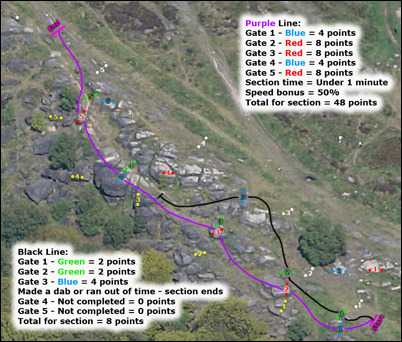 - If the rider dabbed with the foot (either strategic or unintentional) or fell off at any point in the section it was considered a fail and they were 'out', however each gate was a checkpoint so if you managed to get through 4 gates out the maximum of 5 but then dabbed or fell, the points for those first 4 gates were 'in the bag' and added to your score. Note the scoring system was 'positive' - a higher number meant a better score. Here's a graphical representation to help explain... Click the photo for a larger version. 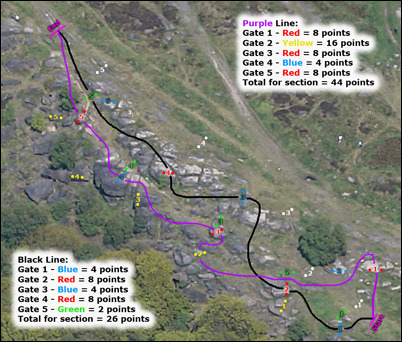 - While clearing White, Green and Blue gates pedals and / or bashguards were allowed to touch the obstacles, but riders were not permitted to intentionally use a pedal or bashguard to obtain a Red or Yellow gate score. The observer's decision about this was final. Riders were encouraged to ask the observer if they were unsure if something they were about to do was allowed or not. - Time limit of 2:30mins per section, with a 50% 'speed bonus' available if all 5 gates in the section are completed in less than the Speed Bonus time. The Speed Bonus time varied and was listed at the start of each section. Example: if your score was 20 but you finished in under the Speed Bonus time, your score would be increased to 30. As before, here's a representation of what could happen if you dab / fall off / run out of time or get the speed bonus. Click for a bigger one! There are some other detailed rules not listed above which may appear fairly complicated, but in reality it ended up pretty simple we think. You could choose to use all of the time available and complete the hardest possible gates, blast through easier ones in an attempt to complete the section in under the speed bonus time, or a mixture of the two! It was designed to be a fun competition and a bit of a tester to see if there is any mileage in such a format, so there were be no formal prizes or presentation, however we had the results compiled on the day so riders could see how they got on compared to other riders! The competition was be supported by the BikeTrial Federation, and ran as a standalone (not connected with any trials series) event at Shipley Glen on Sunday 14th September. 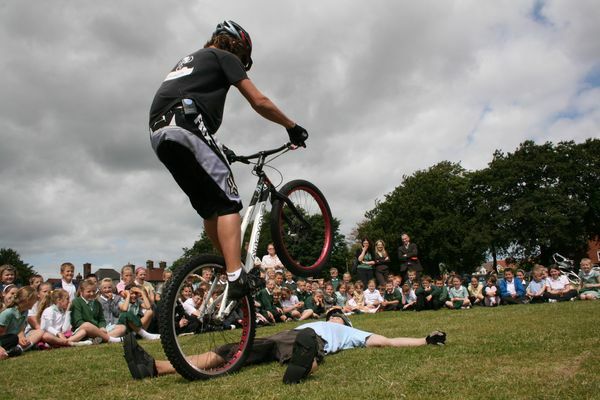 "Be prepared to be amazed by Trials Display, an acrobatic specialty that combines balance, dynamics, strength and suspense by the Worlds top riders who have featured at many events, shows, radio and television programmes including Blue Peter and BBC London news." For a better understanding of this spectacular display team please visit our website where you will be amazed by the skills of our team. With some of the Worlds Best riders including Ben Slinger and Danny Butler, it's easy to see why our team is so popular with nearly 20 years experience between them and a host of titles including 3 World Championships, 2 European Championships and numerous British Championship titles. 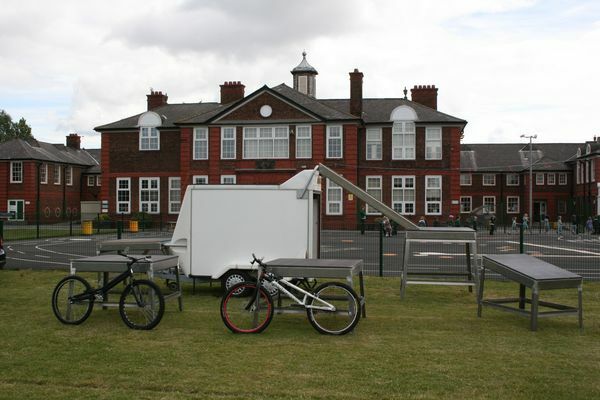 We can cater for any event including schools, galas, product launches, shop openings, cycle races, corporate shows etc. 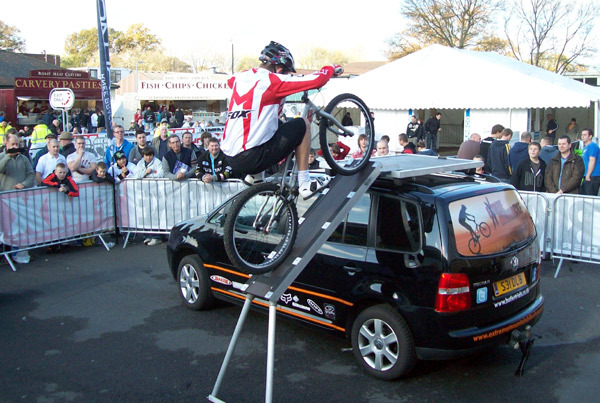 A mountain bike trials display can add an unusual and spectacular attraction at your event! With a full PA System and bespoke Display rig, we can provide a professional show covered with public liability insurance." The Extreme Mountain Bike Trials Show team, run by ex European and multiple British Champion Danny Butler, have performed at many prestigious events such as the 2010 Formula One Monaco Grand Prix and The Dirt Bike Show, but they can put together a great stunt show for any event and budget. 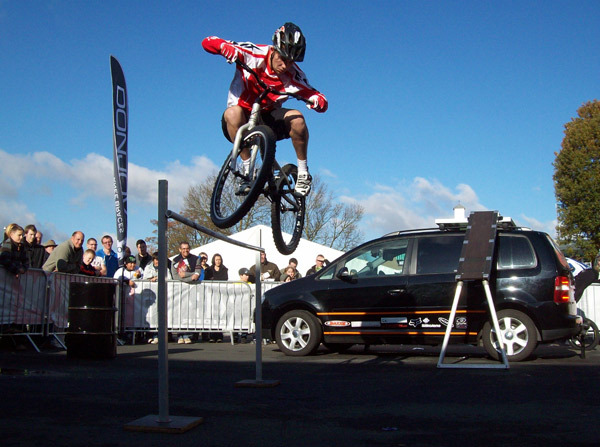 For more information, please visit the Extreme Mountain Bike Show website or contact Danny Butler.